^ Lynn, p. 271: "The Allied figure is the strength in 1702: The Empire (90,000), the Dutch Republic (60,000 + 42,000 garrison troops), and England (40,000). It does not include minor German states or navies." ^ Lynn, p. 271: "Though larger on paper, the French Army's actual combat strength was approximately 255,000. To this must be added, initially, Bavarian and Savoyard contingents." 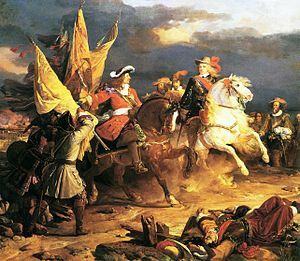 ^ Barton, p.136: "But with her own military strength now but a pale shadow of its former self — at the beginning of the war the Spanish could barely muster 13,000 infantry and 5,000 cavalry." Sainty, Guy Stair. (2004). "The French Succession: The Renunciations of 1712, the Treaties of Utrecht and Their Aftermath in International Affairs."